In today’s edition of Stockist Spotlight, we’re swinging by Greater Goods to chat with co-owners Nicole and Pam. 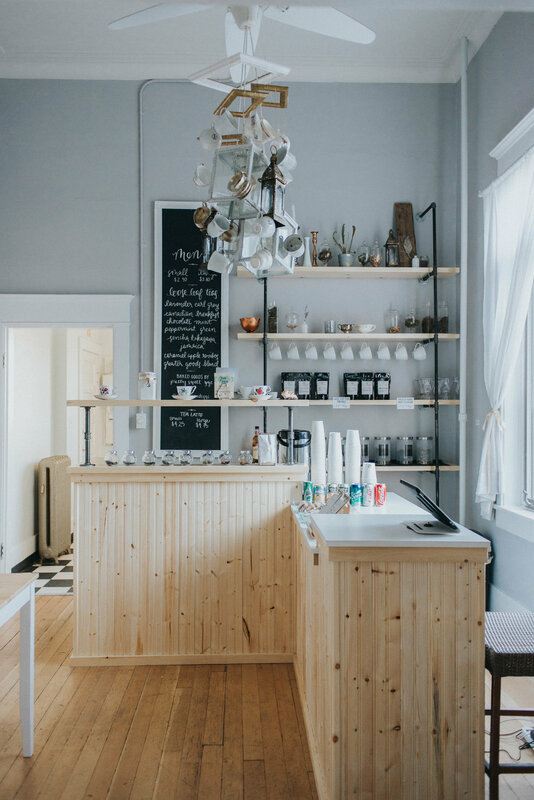 Greater Goods is a hybrid boutique, workshop space and cafe that sells handcrafted goods, baked treats and loose leaf tea. Nicole and Pam are very active members in the Calgary art scene, both owning their own handmade businesses, while playing a large part in fostering a supportive local creative community. We’re super excited to take a peek into the lives of these inspiring ladies. Nicole and Pam, thanks so much for chatting with us today! Tell us a little bit about yourselves. Nicole: I have a Bachelor's of Fine Arts with Distinction (2013) from the Alberta College of Art + Design. In 2014, I launched my handmade jewelry company, Salt Water Tea, and it quickly evolved into a full time business. I am an active member of the artistic community in Calgary, and I showcase my work at many local markets and events. I am the Vice-President of YYC Girl Gang, a volunteer organization dedicated to providing support and opportunities to female artists and entrepreneurs in Calgary. Pam: After acquiring a B.Sc. in mechanical engineering, I worked in oil and gas for two years before returning to school to study broadcasting. I worked as a graphic designer for various news stations and sports networks for 16 years prior to launching Crafted in April of 2015. A self-taught crochet artist, I launched a line of handcrafted dolls and creatures in 2011, called Bubblegum Belles. I also organize and host a rich calendar of workshops and events to help not only promote local artists but spread the love for creative pursuits. Your ongoing efforts in bolstering the local maker community is inspiring. What keeps the two of you so motivated to support other creatives? There are a few reasons - I mean, it's just something we're both super passionate about it so it makes it easy to stay motivated. On top of that, there is just SO much talent in this city - new artists are popping up all the time, making new and awesome products, and it makes it really easy to keep getting excited about local work. Tell us about the maker scene in Calgary. To sum it up, the scene is VIBRANT. There are a ton of artists in and around Calgary, and there are a ton of opportunities here. 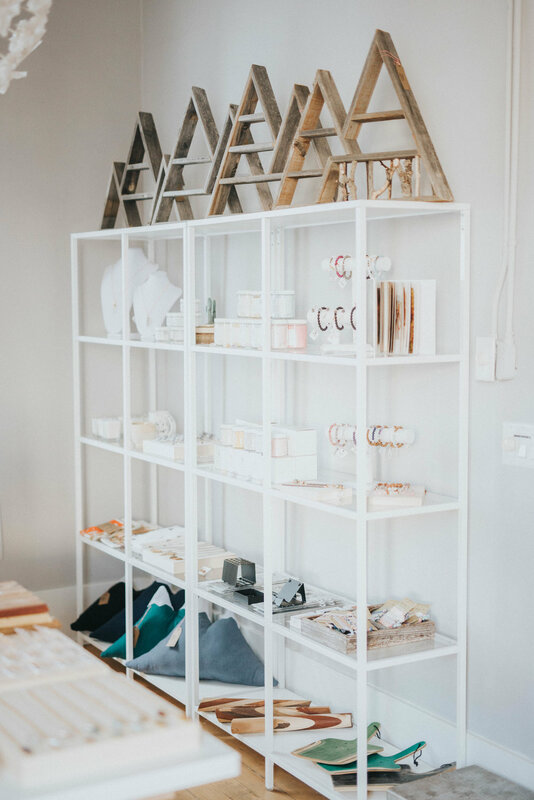 We have some amazing pop-up markets, like Market Collective, Etsy Calgary, Little Modern Market, and Curated. (to name a few! ); and a ton of support from the local businesses. There's so much variety here as well - we've got everything from jewelry, to clothing, to ceramics, knitwear, stationary, and more. Like I said before, there's no shortage of talent in this city, and Calgary has been really receptive to supporting local, even in this poor economy. To be honest, I think that Calgarians are paying more attention to where they spend their money, and they've chosen to keep it local. Which is fantastic. 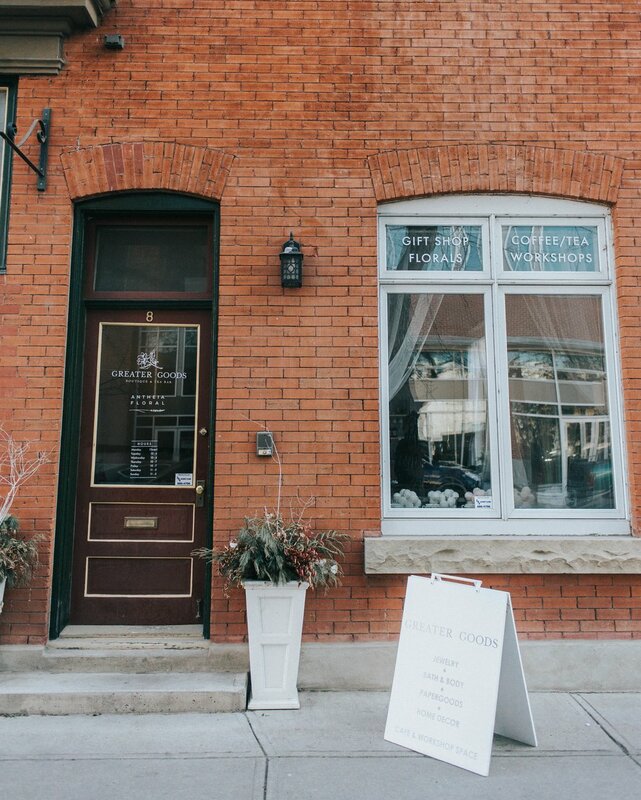 Greater Goods store space, photo by Riana Lisbeth Photography. Cafe corner, photo by Riana Lisbeth Photography. How did Greater Goods come to be? I (Nicole) always had this daydream of owning a little shop or gallery where local artists could sell their work. After developing a business relationship with Pam (she was carrying my jewelry at Crafted), we realized we had similar goals. Pam was already working with local artists through Crafted, and when the space came available, we knew we had an opportunity to showcase and support even more artists together, and decided to make it happen. Pam, how do you balance your time between Greater Goods, Crafted and Bubblegum Belles? It’s take some time (over a year) to get to a point where I felt comfortable taking a step back and hiring staff to work for me at Greater Goods and Crafted. It became necessary for my state of mind and family - both of which are far more important than my business. For over a year I had been working 16 hour days, 7 days a week and was becoming increasingly burnt out. Now I only work 2 or 3 days at Crafted and I’m able to look after all the admin portion of the business the other 2 or 3 days from home. No more working until 11pm! Bubblegum Belles has gone back to more of a hobby at this point. I still have my Etsy shop open but it’s only to sell my amigurumi patterns, so it basically takes care of itself. And Nicole, how do you balance your time between Greater Goods, YYC Girl Gang and Salt Water Tea? That's a great question. Honestly, it's probably my biggest struggle as a business owner. I wish I had an awesome secret, or piece of advise to share with you, but the truth is, it's just a balancing act. If I feel particularly motivated one day, I'll work for 18 hours straight, and that helps to make up for the days where I don't have as much time, or when it feels a bit overwhelming. I make a lot of lists. I work a lot of hours. But I always try and make time for friends, family, and myself. Even if I have to force myself. What advice or insight can you offer for your fellow creatives? What have you learned on your journey that you wish someone could have told you? Everyone in this industry is really friendly. Talk to them. Most of our close friends are fellow creatives. They give amazing advice and support, and completely understand the struggles that you might be experiencing. It's a really great network of people to surround yourself with, so don't isolate yourself. Your competition doesn't have to be your enemy! Greater Goods storefront, photo by Riana Lisbeth Photography.